Vauxhall’s all-new full-size convertible launches the company into a fourth new sector in a year, following on from its Ampera, Mokka and ADAM models. At nearly 4.7 metres in length, the full size, four-seat, fabric-roof Cascada convertible is longer than an Audi A5 Convertible. It is also the first full-sized convertible designed, engineered and manufactured by Vauxhall since the 1930s. While the Cascada shares its dimensions with some full-sized convertibles, Vauxhall is positioning it in the C-sector due to its highly competitive pricing. The C-segment accounts for approximately one per cent of the total UK car market or around 21,000 units per annum and Vauxhall expects the Cascada to make up approximately ten per cent of this segment’s volume per year. Based on price, the Cascada’s key competitors include the Volkswagen Eos and Golf Cabriolet, the BMW 1 Series Convertible and the Audi A3 Cabriolet. Vauxhall’s latest offering is also longer than many other rival convertibles including premium offerings such as the Audi A5 Cabriolet and the BMW 3-Series Convertible. The Cascada range will be priced from just £23,995 on-the-road, nearly £8,000 less than an Audi A5 Cabriolet, when it arrives in showrooms this April. As with all Vauxhalls, first Cascada owners will benefit from Lifetime Warranty, lasting the life of the car or up to 100,000 miles, whichever comes first. ‘The all-new Cascada is an outstanding full-size, four seat convertible with premium qualities and technologies at an affordable, mainstream price,’ said Duncan Aldred, Vauxhall’s Chairman and Managing Director. ‘It’s an exciting time for Vauxhall with Cascada launching the brand in to its fourth new sector in a year, following Ampera, Mokka and ADAM. Cascada’s design team, originally headed by Brit Mark Adams, has created a car with classic lines, redolent of the Grandes Routieres (luxury touring cars) of a bygone age, matched with a capacious cabin and high-quality materials. At 4696mm long and 1839mm wide (excluding mirrors), Cascada has a broad stance and elegant lines. With the top down, it has a perfectly clean profile with no roof-top cover or visible roll-over protection disturbing the car’s silhouette aft of the steeply-raked A-pillar. The subtle ‘blade’ on the Cascada’s lower body side is mirrored by a sharp crease that swings upward and meets with the wraparound rear light cluster. A gently rising waistline is highlighted by a chrome strip that borders the cockpit, marking the boundary between roof-top and body. Sculpted with a purposeful power bulge, Cascada’s bonnet tops a deep front grille with bold chrome applications. The fog lights are carried in two overturned ‘sharkfin’ elements, which are enhanced by chrome inserts. Using LED technology, the daytime running lights in the headlamps and the rear lights incorporate Vauxhall’s ‘wing’ signature. In the rear, the LED modules are diffused to give a solid and sharp light signal – typical of cars in the premium sector. A chrome strip linking the boot-mounted light units matches a similar bar across the front of the car. The Cascada’s fabric roof can be specified in one of three colours, which can be coordinated with one of ten body colours. Other personalisation options include an array of six different alloy wheel choices with sizes up to 20-inch. The Cascada’s cabin mixes the well-equipped functionality of an Insignia’s interior with handcrafted modules not found in any other Vauxhall. Wrapped in a soft-touch material with high-quality stitching, the instrument cluster tops a wing-shaped panel which flows into the doors and frames the area around each front occupant. All-new, deeply contoured seats are available in a range of embossed fabrics and leathers, and customers have the option of ergonomic, Nappa-leather trimmed seats, which can be heated or ventilated. An Easy Entry system allows access to the rear seats, and electric seat belt presenters make securing front occupants less of a chore. With a minimum load volume of 280 litres with the roof down, and up to 380 litres roof up, the Cascada is an exceptionally practical convertible. In addition, the rear seats benefit from Vauxhall’s FlexFold system, which electrically releases and folds down the 50:50 split rear seats, allowing longer objects to be carried with ease. In the cabin, several large storage spaces are available: one in each door and one under the instrument panel, and thanks to the use of a standard Electronic Park Brake across the range, a further cubby is located between the front seats. Maximising torsional stiffness in a convertible’s body is critical to maintaining a high standard of vehicle dynamics. Despite being significantly larger than Vauxhall’s last convertible model, the TwinTop, by 71mm in its wheelbase and 56mm/70mm (front/rear) in its tracks, the Cascada’s body is 43 per cent stiffer torsionally and 10 per cent more resistant to bending forces. Targeted underbody strengthening helps the Cascada achieve these figures. Crossed steel bars are mounted to the Watt’s link, across the B-pillars and front subframe, while high-strength tubular steel reinforcement sits inside each of the A-pillars. Collectively, these stiffen the body substantially, leading to precise handling and an exceptionally high degree of acoustic comfort. Vauxhall’s HiPerStrut suspension has been adapted from the 325ps Insignia VXR and employed at the front of the Cascada. The HiPerStruts combine all the benefits of a conventional MacPherson strut set-up – compact packaging and light weight – but without the drawbacks of that system, such as torque-steer and a loss of traction under hard cornering. The HiPerStrut achieves this by a reduction in kingpin inclination, meaning no loss of negative camber during cornering, and therefore greater stability overall. At the rear, the Cascada uses a combination of compound crank and Watt’s link, with the thickness of each different model’s axle beam varying to cater for different kerbweights. The Watt’s link rods are connected to a cross member just behind the rear wheels’ centre line. Any lateral force exerted on one side is compensated for by an equal force on the opposite wheel. Cars using a compound crank and Watt’s link are rare in the industry, but it’s an innovative solution which provides a unique blend of excellent packaging and strong rear-end stability during cornering. Precision, feedback and confidence. These were the three target elements for the Cascada’s UK-specific steering programme. The challenge was to maintain the system’s ease of use at lower speeds, but dial in a greater degree of involvement and slightly more effort at higher speeds. The Cascada uses a rack and pinion steering system with speed sensitive assistance. But in order to provide drivers with more steering feedback, the system’s electric motor is mounted directly on the steering rack, as opposed to the base of the steering column. The key benefits of using electric power steering (EPS) are well known. At low speeds, the level of power assistance is increased to minimise steering effort. At higher speeds, assistance is automatically reduced to ensure a high degree of steering feel for the driver. The second important benefit is that, because it does not require an energy consuming hydraulic pump and responds directly to the amount of power needed at any speed, fuel consumption is also reduced. FlexRide, Vauxhall’s adaptive damping system, will be available as a £790 option across the Cascada range, complementing the significant revisions to the new model’s chassis. FlexRide automatically adapts to prevailing road surfaces and driving styles, providing drivers with fully optimised handling, even in the event of an emergency situation. At the heart of FlexRide is the Driving Mode Control (DMC) which oversees and executes the system’s settings, allowing the car to react to sudden changes in driving style or emergency situations. For example, if the driver needs to avoid an obstacle while in ‘Tour’ mode – the softest of the three settings – chassis sensors convey this to the DMC and the dampers are adjusted in a split second. Standard mode (the default setting) reacts in the same way as Tour, but when drivers select Sport they not only get stiffer dampers, but more steering effort, sharper throttle response and an instrument panel that’s back-lit in red, rather than white. Each of these settings can be dialled in or out of Sport mode via the Cascada’s configurator. Crucially for weather-hardened UK buyers, Cascada will feature a high-quality fabric hood, with optional superior acoustic and thermal insulation thanks to a special layer of polyester fleece between the outer and inner linings. The key point of any convertible is the roof which on the Cascada is aerodynamically clean and refined, fits perfectly to the pillar less style of the car and disappears completely below a high quality tonneau cover when lowered. As well as reducing the vehicle weight by approximately 100kg compared to a hard top, the soft top also measurably lowers noise inside the car. Making the Cascada a practical year-round car, the hood can be opened in just 17 seconds, at speeds up to 30mph by an interior switch, or via a button on the key fob. The operating switch is conveniently located in the lower centre console. Operation is instinctive, the hand naturally dropping onto it, allowing the driver to keep his or her attention firmly on the road. All windows can be opened or closed and locked in just four seconds by operating the four-windows-switch. Heavily tested by Vauxhall engineers, the electro-hydraulic mechanism for the roof has been opened and closed 15,000 times, corresponding to ten years of usage with four operations per day. The roof can be operated from -5 to +85 degrees Celsius. Boot space of 280 litres when the roof is opened gives more flexibility to drive top-down even with big loads in the boot. Loading capacity can also be extended by 50:50 flex fold rear seats for longer and bigger objects with up to 750 litre loading capacity. This is not possible with other C Segment HardTop rivals. The standard two-layer soft top has a premium class three-layer exterior fabric made of highly-resistant polyacryl, an elastomeric rubber combining film and a backing fabric. Worldwide testing at extreme temperatures has proved that it is absolutely weather proof and insulation is superior to a retractable hard top. It needs no regular impregnation and is UV resistant so that it remains long-term colour fast, keeping the car looking good. The roof is also car wash proof. The visible inside lining is made of woven polyacryl. Between these two layers is an insulating layer of air. The optional acoustic soft top offers even better noise and thermal comfort with acoustically enhanced exterior fabric and by adding a special layer of polyester fleece between the top layer and the interior lining. This improves thermal insulation and further reduces the noise level in the cabin by up to a third (-3 dB) helping to create a quieter and more relaxed interior ambience. A foldable windbreaker can be mounted behind the front seats. It is fixed on recesses in the side trim behind the rear seats and near the rear seat backrests. The upper part can be folded into vertical position to deflect wind, the horizontal part stays fixed, so the rear seats cannot be occupied when the front seat windbreaker is mounted. A small windbreaker can be mounted between the rear head-rests to reduce drafts on the rear seats. Both windbreakers come in a purpose-made bag that can be stored and fixed behind the rear seat backrests. The Cascada will come with a broad range of powerful and efficient engines. Starting the line-up is a 1.4-litre (140PS) Turbo petrol, with a manual gearbox, achieving a combined 44.8mpg and 148g/km CO2, and a 2.0-litre (165PS) diesel engine with manual and automatic transmissions, achieving up to 54.3mpg combined and 138g/km CO2. Both engines have start/stop technology. 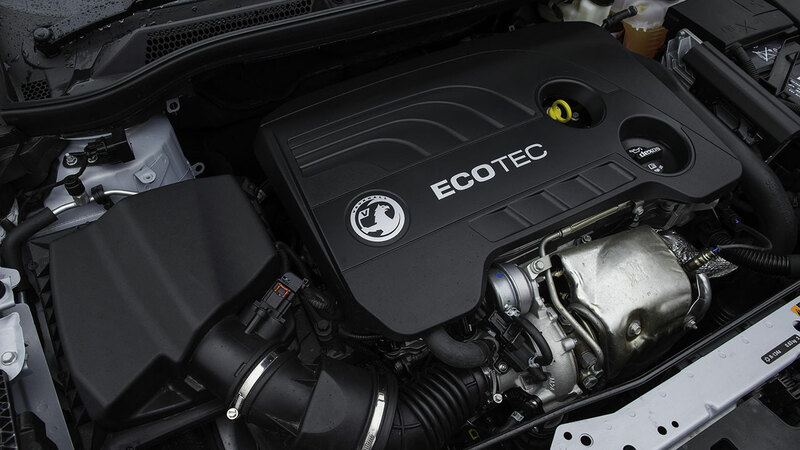 But the highlight of Cascada’s powertrain line-up is the all-new 1.6 SIDI Turbo ECOTEC petrol engine. The first production engine from Vauxhall’s MGE (Mid-Size Gasoline Engine) family, the unit offers major improvements in torque, linearity and overall efficiency. It produces a maximum 170PS from 1650-3200rpm and up to 280Nm of torque, giving a 0-60 time of 9.2 seconds and top speed of 135mph. This engine will be available shortly after launch with a new, low-friction automatic six-speed gearbox that contributes towards combined fuel consumption of 39.2mpg and emissions of 168g/km. To improve performance and refinement, one of the key engine development objectives for engineers was to lower overall levels of radiated noise and vibration, with no unusual sounds. Optimisation of the induction and exhaust systems included decoupling the cam cover from the cylinder head via specific fasteners, and a sealing system designed to resist high temperatures from the adjacent turbocharger. With direct injection and pulsed combustion, engineers were able to substantially reduce noise levels compared to the previous engine. As a result of these ’sound-engineering’ measures, customers will appreciate quiet and smooth idling, with a pleasant sound quality even at high road speeds, engine speeds and loads. The engine provides the perfect basis for gentle, smooth open-air cruising, while always keeping immediate propulsion power at the ready as needed. A high-performance 2.0 (195PS) Bi-Turbo diesel engine with manual transmission will also be available shortly after launch. The Bi-Turbo achieves a combined 138g/km and 54.3mpg, yet accelerates from 0-60mph in just 8.9 seconds up to a top speed of 143mph. In addition to impressive new engines, there are also new six-speed manual and automatic transmissions. The latest generation Vauxhall manual transmissions enable even more precise and smoother gear shifting. Engineers have achieved shorter shift patterns, while at the same time reducing shift forces. To achieve this, the six-speed manual transmission was comprehensively reworked with modifications to the shift mechanism. These measures focused on increased efficiency, with further improved precision, shift forces and comfort when the transmission is cold or hot. The focal points in the development of the second generation six-speed automatic transmission are increased efficiency and faster shift times, together with lower noise and vibration. Thanks to a small torque converter, engineers were able to reduce inertia. Optimised bearings, joint rings and friction elements also ensure a higher degree of efficiency. A further key feature is the coil spring inside the torque converter, for which the spring rate has been halved to improve vibration damping. This advanced automatic transmission is available with both the 1.6 SIDI Turbo petrol engine and the 2.0 turbo diesel. The Cascada brings together all Vauxhall’s latest, innovative technology as part of the UK offer. This includes options like: AFL+ (Adaptive Forward Lighting) with up to 11 automatic lighting functions; Front Camera System, including Traffic Sign Recognition, Lane Departure Warning, Following Distance Indication and Forward Collision Alert; rear-view camera; heated steering wheel; Hill Start Assist; Side Blind Spot Alert. Using an extremely rigid passenger cell made mainly from high-strength steel, the Cascada is designed for the least deformation and largest possible survival space in the event of a crash. Its doors have diagonally-mounted ultra-high strength steel beams and beltline reinforcements. The A-pillars supporting the windscreen are made from press-hardened steel. And in the event of a roll-over incident, pyrotechnically activated, spring-loaded high strength bars automatically deploy behind the rear seats. These pop-ups are also triggered during other severe impacts, eg. when airbags are deployed. Front seats both benefit from two-way active headrests and double seat belt pre-tensioners; even the two rear seats benefit from seat belt pre-tensioners. With its German rivals firmly in its sights, the Cascada offers affordability paired with outstanding levels of equipment, technology and luxury. Adverse Weather Light: Wiper or rain sensor activated for better vision in bad weather conditions. Pedestrian Area Light: Wider spread of light by up to eight degrees to left and right. The Cascada comes in two trims, SE and Elite. Range pricing starts from £23,995 and Elite pricing starting from £26,095.